Randolph Engineering Sportsman - 23K Gold / Tan Polarized Need Help? Proudly manufactured in America and standard issue for the U.S Military for over 3 decades, RANDOLPH ENGINEERING is the real McCoy. With over 200 mostly by hand production steps, one pair of Randolph sunglasses actually takes more than two weeks to make. Frames are made using the finest raw materials and alloys to be found in the world and feature mineral glass lenses providing superb optics. Designed for the outdoor enthusiast, the enduring Randolph Engineering Sportsman style is an essential piece of equipment to bring on your adventures. 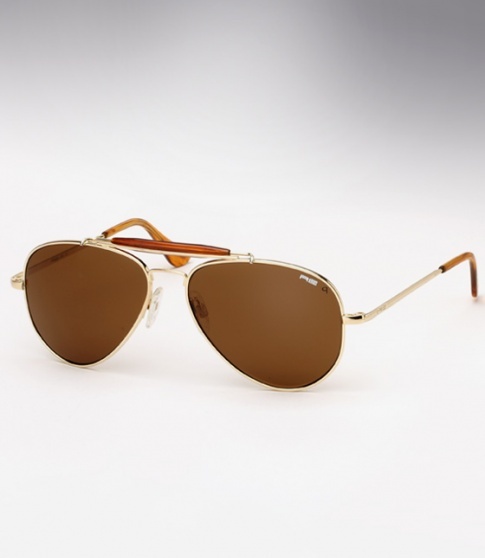 It is a classic ‘tear drop’ aviator shape with the addition of a sweat-bar for a unique touch. They feature glass polarized lenses with a back anti-reflective coating, providing superb optics and virtually eliminating distracting glare from both in front and behind. Frame is plated in 23K gold.